I’ve been investigating Azure Search with Sitecore’s new Azure App Service offering. I’ve got a giant Excel file of benchmarks and charts based on several permutations and configurations, and several other interesting tidbits that I need to organize into posts to this blog . . . so look for much more about this general topic in the future. For now, I thought I’d share a point I’ve confirmed with Sitecore support regarding a limitation of Azure Search with Sitecore’s CloudSearchProviderIndex. The CloudSearchProviderIndex is what the standard Platform-As-A-Service product from Sitecore will use in place of Lucene or Solr or Coveo to power content search for Sitecore. This is the key building block for working with Azure Search through Sitecore. While I was performing performance benchmarks for search re-indexing with Sitecore, I noticed the Azure Search document count would drop to 0 and I’d see odd results from Sitecore requests that depended on the search index. This was classic “search index is being worked on, don’t rely on querying it until the work is done” behaviour. This was corrected several years ago through Sitecore’s addition of a SwitchOnRebuildLuceneIndex and equivalent for Solr . . . but there is no such equivalent for the CloudSearchProviderIndex used by Azure PaaS solutions. Essentially: Sitecore is using a single copy of search indexes for query and re-indexing operations, limiting the availability of search during maintenance work. One could argue this may not be such a big deal because one may not rebuild Azure Search indexes with any frequency. I’m not sold on this argument, however, since the Sitecore projects I know will frequently perform re-indexing due to development changes to the schema, content synchronization demands, or just routine deployment standard practices. For reference, with Lucene indexes this operation would take 5 minutes or less. The scaling options for Azure Search, Partition count and Replica count, have a minimal impact to the re-indexing operation. I’ll go into details of this later, but it could be that . . .
20,000 Sitecore items is too small a figure to benefit from scaling with Azure Search? Many customers have 100,000 or more items, so perhaps I should evaluate a larger data set. For the time being, Sitecore has responded that improving the availability of Azure Search indexes during rebuilds is an official “feature request” and assigned reference number 146822. High availability for Azure Search pertains to queries and index updates that don’t involve rebuilding an index. If you add or delete a field, change a data type, or rename a field, you will need to rebuild the index. To rebuild the index, you must delete the index, re-create the index, and reload the data. To maintain index availability during a rebuild, you must have a copy of the index with a different name on the same service, or a copy of the index with the same name on a different service, and then provide redirection or failover logic in your code. It looks like providing for high availability would double the price of Azure Search indexes, so there are a cascade of complications related to this. My investigations into Sitecore and Azure Search yielded this complication — it’s not insurmountable, and I actually find it fascinating how an on-premises product (classic Sitecore) will evolve into a cloud-first product. This is just one piece of the evolutionary story. I expect this will be addressed sooner rather than later in an official upgrade or patch from Sitecore, and until then it’s important to understand this nuance to the Sitecore PaaS landscape. This is Sitecore’s new re-envisioned Commerce product. Anyway, the last real work I did with Sitecore Commerce was in 2015 and I recall the installation/configuration process being arduous, with both Web and Desktop elements, lots of security hoops to jump through, COM everywhere, and even registry edits for good measure. It’s these sorts of nuances that I recall from previous run-ins with the Commerce platform Sitecore inherited and now fully owns. In some respects, not all that much has changed. On the bright side, there is a lot more documentation than I’ve seen before on this set of products. I worked with Sitecore Commerce at a time when there was essentially no real current information about the product, so maybe I’m satisfied too easily with what is now available . . . but I really found this an area Sitecore has improved upon. 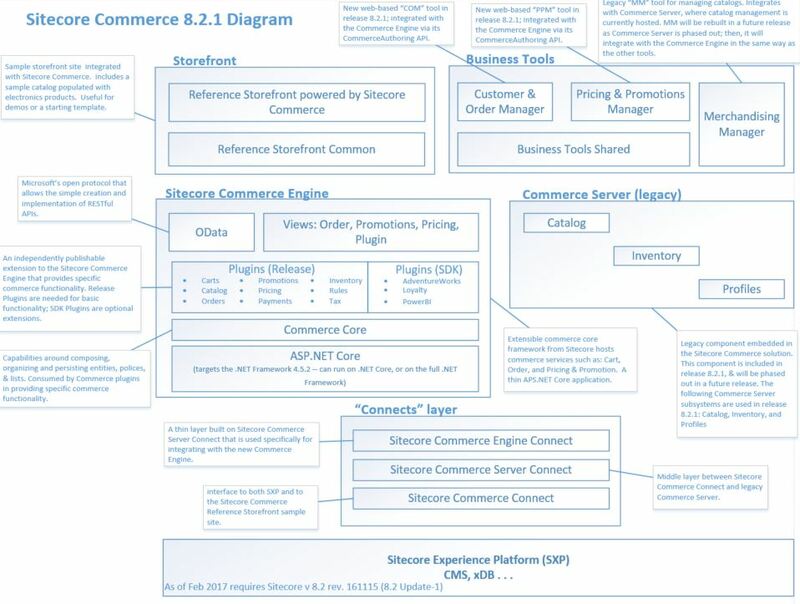 The above is just consolidated from a variety of pictures and notes contained throughout the official documentation from Sitecore on the subject, but one of the ways I digest a system is by diagramming and scribbling notes as I go through a project. Maybe others will find it useful, too.